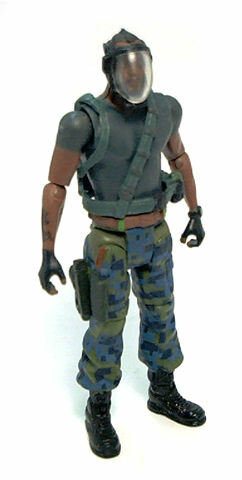 Even stranger, considering how little he appeared on-screen, Mattel produced two different versions for Private Sean Fike. The first was a regular RDA Marine version, armed with a flamethrower, but the version I’m reviewing here is the second one that comes with a Bio-mask. 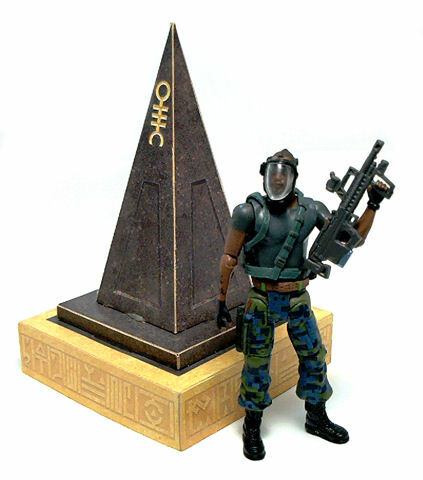 This version of Fike shares the same body as the regular version of the character, with only the head being a newly sculpted piece. 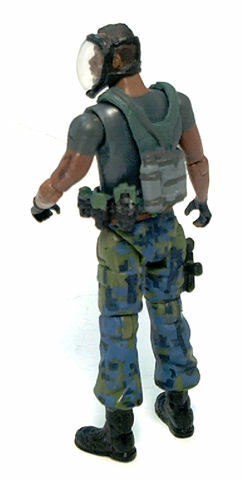 Fike wears blue and green camo BDU’s similar to those on the Miles Quaritch figure, although the leg pieces are a different mold. The torso and arms, on the other hand seem to be the same as Quaritch’s, with gloves and T-shirt just painted onto them. To add some extra detail, Fike wears non-removable webbing with assorted pouches and containers sculpted on. 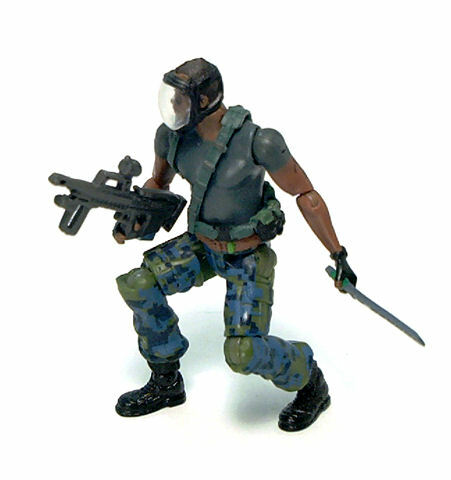 The breathing mask this figure is named after is also not removable, although the straps and mask frame are all sculpted onto the head, with only the clear faceplate glued in place. From what I can see, the face underneath has a decent likeness to actor Sean Anthony Moran, who played Fike in the movie, and the paintjob looks underneath the mask. • Swivel neck. Full 360° rotation. • Peg & hinge shoulders. Great lateral extension and full rotation. • Peg & hinge elbows. Rotate 360° sideways and can bend slightly over 90° going forward and almost 90° bending backwards. • Swivel waist. Full 360° swivel. • Double hinged hips. Trademark Mattel design, allowing the legs to extend sideways as well as rotate back and forth. • Peg & hinge knees. Very good bending range and sideways swiveling. • Peg & hinge ankles. Excellent movement up and down, as well as sideways rotation. The paintjob is a little more varied than that on the Quaritch figure, although most of the pieces were molded in the appropriate color of plastic to begin with. Some extra painted details were added in the form of small tattoos on the arms, but I’m having a hard time making out what they are. The one at the right forearm looks either like a bird of some sort perched atop a tree or as a dragon, while the one at the left biceps looks like either a scythe or a brave feather. Pvt. Sean Fike comes armed with the same assault carbine issued with the RDA Norm Spellman figure, molded in gray with silver paint apps to the ammo magazine. 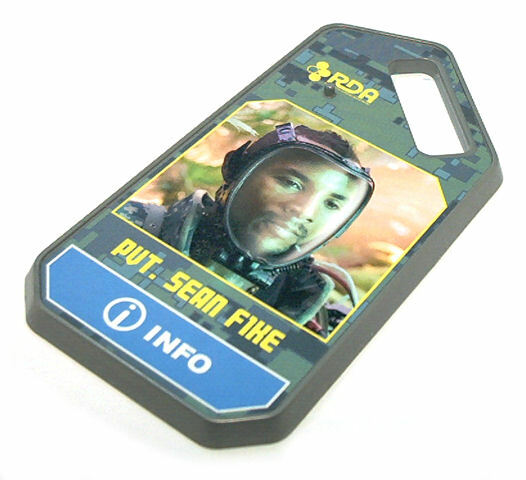 The other only extra is the obligated iTag base plate, molded like the RDA dog-tags and a sticker on top with Fike’s portrait. 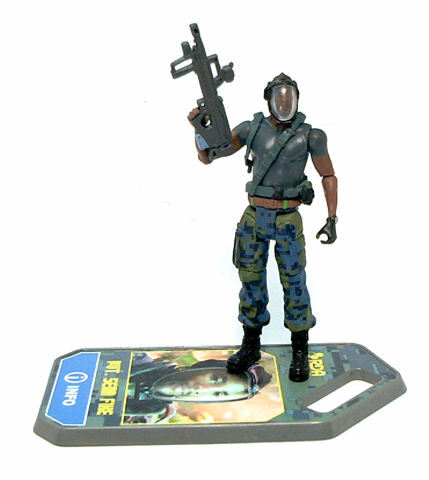 The CGI model associated with the plate at Mattel’s Avatar site is that of the breathing gear the RDA personnel on Pandora wears when going outside, called Exo-Packs. Trivia tidbits about what the gear does and air composition on Pandora sprout when the Info icon on the iTag is covered, accompanied by sounds of heavy breathing. Human figures in this line are still way too scrawny to compare favorably against the likes of G.I. Joe, but I’d say Fike looks even better than Quaritch thanks to the extra bulk added by his webgear. How hard could it be, Right? But it’s still a cool figure ;). Yeah they should have made it removable, they made the guns and knife removable, why not the mask? anyways great toy to collect still!